The OATUG would like to thank its 2019 Star Partners* for their continued support and dedication. The OATUG Star Partner Program provides OATUG Associate members with an active, integrated way to participate in the OATUG community. Users of both on-premises (Oracle E-Business Suite and EPM/Hyperion) and cloud applications (ERP Cloud, CX Cloud, EPM Cloud, SCM Cloud); practical hybrid solutions; and Big Data, BI and Analytics benefit from easy access to a knowledgebase of solutions provided through the OATUG Star Partner Program. Interested in becoming an OATUG Star Partner? Please contact Christine Hilgert at sales@oatug.org. COLLABORATE 19 Wrapped Up Last Thursday: So What's Next? COLLABORATE 19 had it all: big reveals, fantastic speakers, a vibrant tradeshow and fun. While some of that lives on only in memories and photographs, the content is here to stay. Within the next few weeks, we will offer all registered attendees a zip file in The Hub's COLLABORATE community, giving you a quick and easy way to download all of the OATUG session materials in one fell swoop. Not able to attend? We will also import the sessions into The Knowledge Base for all OATUG members. CO19 attendees: Keep in mind that if you want to obtain materials from any of the COLLABORATE sessions conducted by Quest or IOUG, the app (mobile and desktop versions) is the only place to snag those, and that access is available for just one more month. How to tell which sessions are OATUG's and which are others'? The session numbers are the key. Five digits are OATUG. (That's a high five from OATUG!) Fewer digits or more...those are the sessions you can only access through the app. We are already looking forward to hosting you in 2020! Save the date for #C20LV, April 19-23, 2020, at the Mandalay Bay Hotel and Casino in Las Vegas. Get Updates. 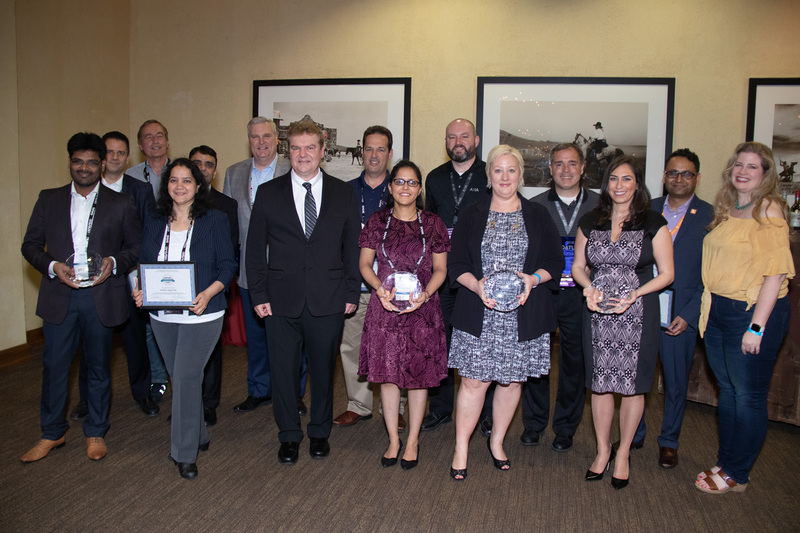 On April 7, Board President Doug Manning announced that OAUG is now the Oracle Applications & Technology Users Group (OATUG) to better convey our ongoing commitment to serve members working in both functional and technology roles. We are so excited about this next chapter in the story of OATUG and hope our excitement extends to you. Last Wednesday, OATUG volunteers and award winners were recognized at a VIP reception held in their honor. Congratulations to Kirby Lunger, 2019 OATUG Member of the Year! Read more about her contributions and those of all other 2019 winners. OATUG is a community of people powering progress. Here users of Oracle applications and technology connect with and learn from each other, experts, solution providers and Oracle product development teams. The Knowledge Base is there for deeper dives—your go-to resource for conference presentations, webinars and articles when you need to know what’s new, what’s next and what’s worked for others. OATUG Insider is a weekly source of aggregate news from all over the Internet. Receive news stories, including headlines relating to Oracle, business, technology and industry. If you’re not receiving OATUG Insider every Tuesday, read the current issue and subscribe today. Not An OATUG Member? Join today! OATUG eLearning provides free live and recorded educational webinars for members. Attend upcoming webinars or access hundreds of recorded eLearning sessions any time through the The Knowledge Base. Interactive Vendor Awareness Session webcasts provide information about a variety of products and services that complement Oracle Applications. We are still accepting applications for 2019. If your company is interested in hosting a session, please contact Ally Zarcone . OAUG Geos and SIGs offer news from Oracle and educational opportunities all year long. To find your Geo or SIG, visit the Geographic & Special Interest Groups page. Stay up to date on upcoming educational webinars, conference calls and face-to-face events. Find upcoming educational opportunities, regional and virtual networking events, and special conference events on the Conferences and Events Calendar.